Chinese state planners are good at building bridges and roads. Now they have set themselves an even bigger challenge: persuading consumers to pay for home-grown music. Bureaucrats plan to expand China’s music industry to 300 billion yuan ($47 billion) by 2020, according to Xinhua. The target shows just how out of touch they are. China’s entire music business was worth about $790 million last year, according to estimates by PricewaterhouseCoopers – smaller than Australia’s $1.2 billion. Even in the United States, music purchases, concert tickets and the like brought in no more than $16 billion in 2014. China’s lack of development owes a lot to rampant piracy. There is no culture of paying for music in the People’s Republic: customers have long downloaded tracks for free or bought pirated CDs. The government is belatedly trying to change that. It forced internet providers to remove 2.2 million tracks after new rules on content came into force in July. Web giants like Tencent have struck deals with foreign music companies and are fast building libraries of legitimate tunes. Even so, it will be tough to get customers to pay for anything other than funky ringtones. It’s a problem shared by many western countries, where live music events have become a bigger source of income than recorded music sales. 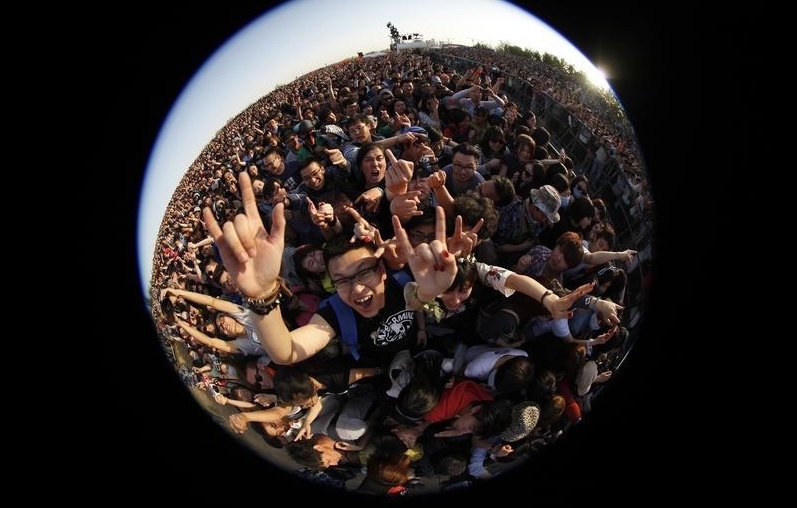 But China’s Communist Party tends to be wary of large crowds that are not under its direct control, so rock festivals are unlikely to have a bright future in the People’s Republic. The biggest obstacle, though, is the party’s desire for ideological control. Neighbouring South Korea has become an Asian cultural powerhouse, exporting films, soap operas and songs like the 2012 hit “Gangnam Style”. But South Korean pop acts don’t have to contend with China’s thought police. China’s new internet content rules are as much designed to preserve social stability as to clean up piracy. U.S. rockers Bon Jovi had their first tour of the mainland cancelled earlier this year after pictures of the Dalai Lama at a previous gig surfaced. Many of China’s pop stars, including first lady Peng Liyuan, trained with the People’s Liberation Army. China’s military machine may be fearsome, but it’s unlikely to have neighbouring countries dancing in the street. Chinese state planners want the country to produce music industry output of 300 billion yuan ($47 billion) by 2020, the state-owned Xinhua News agency reported on Dec. 2. The goal is part of China’s latest Five-Year Plan, a blueprint for economic and social development between 2016 and 2020. The target reflects a wide drive to boost Beijing’s soft power, and aims to build large-scale music companies with international reach. China’s music market is currently tiny given the size of its population. PricewaterhouseCoopers estimates the industry’s total size at $790 million in 2014, compared with the global market of $46 billion. The People’s Republic stepped up the fight against online music piracy this summer, when the National Copyright Administration of China ordered websites to remove 2.2 million songs from their platforms. The tightening of controls on piracy parallels an ideological crackdown on content deemed a threat to China’s stability, with internet companies to be held responsible for policing online content on their platforms from Jan. 1.